'twas a sad day last Friday. I had to get rid of the car that featured in Love... From Both Sides. Yes, Laura McIntyre's little red peril was indeed based on a real car. A 1997 Nissan Micra that my other half had been nursing around since the summer of 2011. 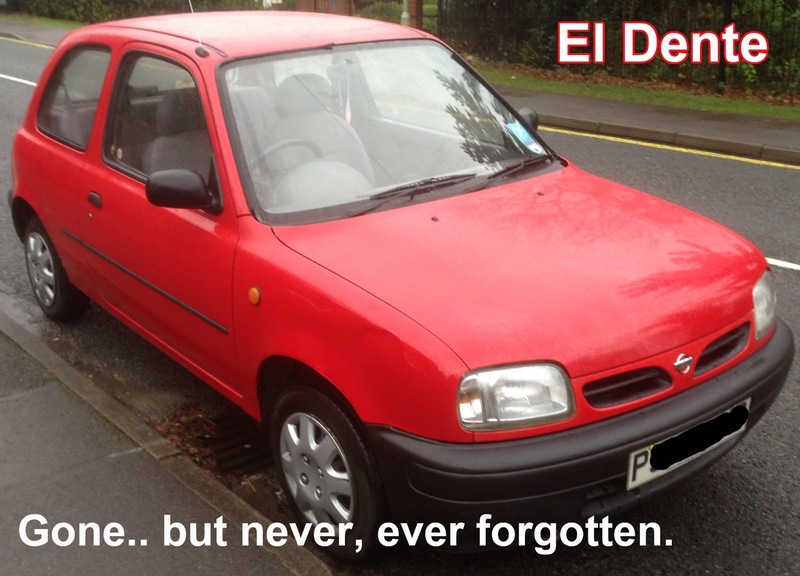 She's the one who nicknamed it 'El Dente', so you have her to thank for that particular gag in the book. Unfortunately, the little bugger was on its last legs. The exhaust had more holes in it than the plot of The Dark Knight Rises, if the temperature dropped below ten degrees it point blank refused to start, there was a disconcerting smell coming from the air vents (like a combination of warm porridge and Swarfega as far as I could tell) and the steering was so heavy, it needed arms like Popeye to do a three point turn. It was well and truly fuckered. Thank goodness for Ebay. I flogged it to two enthusiastic teenagers for £350. They promised to take good care of it, so I confidently expect to drive past it wrapped around a lamp post at some time in the very near future. El Dente is no more. Commiserate with me for just the briefest of moments, won't you?